I found this cute diaper bag at Baby's R Us. I doubt Travis would be ok with toting this around though. 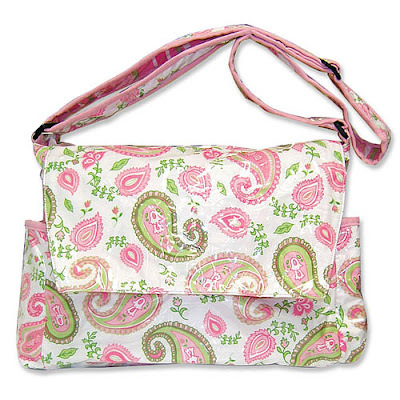 Any suggestions on where I should look for a cute diaper bag? I blogged about this on Feb 14. You may find a great bag for YOU and a great bag for Travis. I love that diaper bag! It's probably not outragously over priced either? I think pink suits Trav...only a real man can carry a pink oh and paisley Diaper bag! Make Trav carry the carseat, you can carry the cute bag. i say get the bag for yourself and then get him a "manly" one. Target has a small-sh diaper bag for daddies in a camo fabric that's fun.